Coming to the end of the summer break, one free day left. The old diy madness is gripping "just....one ...more....synth!!" Found this panel with banana sockets, leds, mom switches and toggles, everything wired up already. 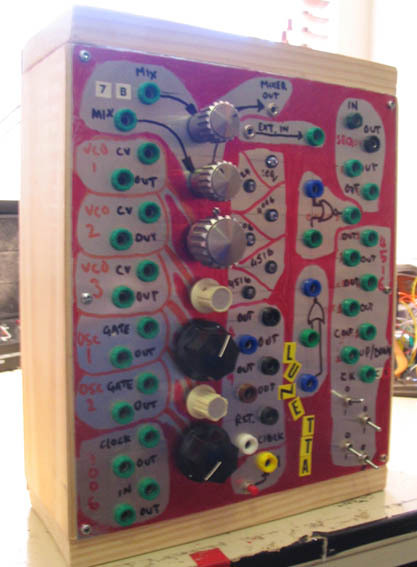 so its a challenge to build a Lunetta synth in 24 hours. What's a Lunetta? Find out more HERE! its 5pm wed 18/02/09. Tonight I will plan, tomorrow solder. 23 hours 58 minutes later - 1st smoke test = passed. mostly works, some debugging to do another day.